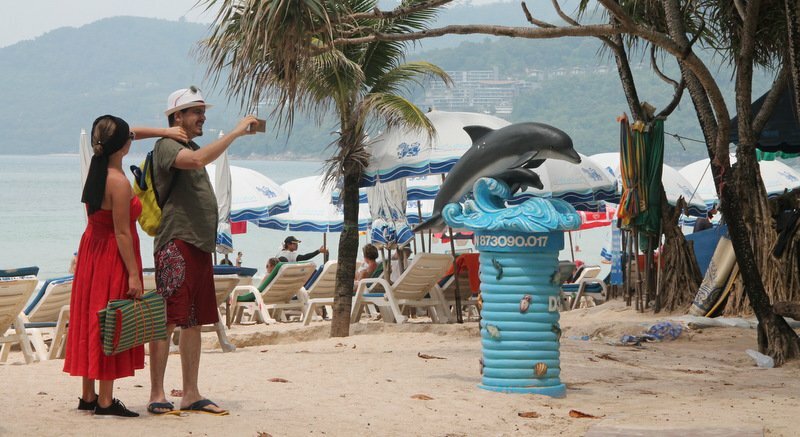 PHUKET: Trash and water quality of Phuket’s beaches are considered badly managed, according to the results of a management research survey conducted by the Prince of Songkla University (PSU) and displayed at their Phuket Campus yesterday (Dec 14). “We obtained feedback from 1,624 participants on Phuket’s beaches including tourists, village headmen, students and private businesses in the area. The data was collected between Oct 2016 and Sept 2017,” said Dr Chantinee Boonchai who led the public announcement at the university yesterday. Dr Chantinee, who is a lecturer at PSU and also a member of Andaman Environment and Natural Disaster Research Centre (ANED), added, “The main purpose of this research is to obtain information as the foundation strives to support the beach management and give officials in Phuket direction. “The research is also for the community to unite and take action to preserve the environment that surrounds their lives,” she added. “According to the survey, foreign tourists’ priority is to see a ‘natural’ beach without buildings. Their second priority is they want to see beaches that are clean without trash,” said Dr Chantinee. Also in response to a survey of hundreds of foreign and Thai tourists, foreign tourists gave Patong, Kata and Karon beaches as their top choices, while Thai tourists preferred to visit Kata and Nai Yang beaches. The event was also used to promote the “Smart Beach Project”, though which community groups could mark which beach areas they would help clean and what types of cleanups the groups would be carrying out. 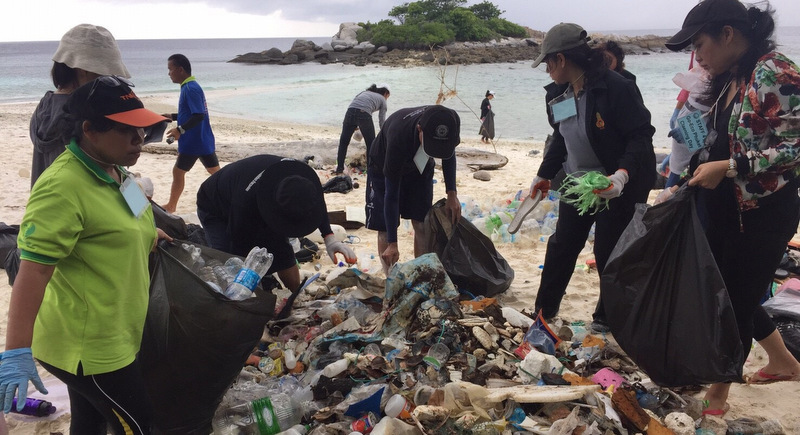 “We also need supporters including students, expats or anyone to help hold activities to clean up trash, foam and polluting materials,” Dr Chantinee said. “All data collected will be handed over to Phuket Governor Norraphat Plodthong in the coming week for the next step in dealing with the issue,” Dr Chantinee added. I agree! The big  amount of tourists from Luxembourg not coming to Thailand anymore is a huge factor in the dwindling tourists  numbers from European countries.But i miss in the list the Kingdom of Belgium.Do they not care about environment or do they not value democratic way of life? Probably hundreds of thousands tourists from that country not coming anymore too. Phang Nga Province, just north of Phuket. Previously full during High Season with tourists from democratic European Kingdoms. Norway, Sweden, Denmark, The Netherlands, Luxembourg. All countries with splendid environment care. Clean beaches during their Summer seas, and where you can drink water from the tap, like in Singapore. Point is, in the past there was a relaxed Phuket beach culture. Very much thai style, everybody thai beach entrepreneur was doing his own thing. Making lot's of money with small beach restaurants, extended 'terraces' here and there ( Naiharn). The tourists did like it. A chair, a umbrella, snacks and drinks at chair, easy to have a lunch under the trees. Etc. You can see the rubbish in the pictures. Look at the first one, someone's left an big ugly "NO SWIMMING" sign right in the middle of the sand. I mean there's no waves so it can't be there by design... right? "It's generally Thai's that drop their.."Of course a tourist would never do this.They are all so educated.As biased as it get! The tourists no longer come to Phuket because there isn't much they do like about the beaches anymore. Pollution, trash, jet-skis, no chairs + umbrellas. no shops, no vendors, no little restaurants. Most tourist don't like how the beaches have changed. As predicted 3 years ago, western tourists are going elsewhere. To clean the beach is easy. You need bins all along the back of the beach under the trees for the trash. Then as 90% of the beach is for the jet ski and parasailing then they should be cleaning their section of beach. Then where the plastic chairs are they should be cleaning their section of beach. Then if any complaints for that section remove their license to use the beach for business. simple.